In the early 1990s, the advent of fMRI revolutionized the understanding of brain and paved the way for major discoveries of the last decades in neuroscience. However, fMRI is not suited for many clinical applications. Cost, size and portability of MR machines limit the patient accessibility to this modality. In neonatal pediatric neurology, fMRI is rarely performed because of specific issues concerning practical exam complexity. In neurosurgery, fMRI cannot be performed into the operating theater to monitor patient cerebral function. For all these reasons, there is always room for cutting-edge research in the development of new neuro-imaging modalities. Preterm infants can have brain development issues that requires an early diagnostic and adequate monitoring. 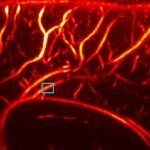 Mapping the vascular resisitivity can bring valuable information to the clinician on how the brain is developing. Performing functional ultrasound imaging during epilectic seizures could lead to a much better understanding of neanotal seizures. As fUS imaging is a bedside modality, it could potentially replace fMRI imaging in many clinical situations where a fMRI exam is today mandatory. fUltrasound and ultrafast Doppler can be used during neurosurgery. We are currently investigating functional ultrasound imaging and ultrafast Doppler imaging to help the neurosurgeon to delimit functional regions when they proceed to tumor resection in specific areas of the cortex. Together with neurosurgeons of La Pitié-Salpétrière hospital, our team has performed a world premiere: for the first time, neurofunctional ultrasound (fUS) imaging of cerebral activity was performed on adult patients undergoing a surgery to remove low-grade gliomas located in their brain. This type of surgical procedure is conventionally guided using electrocortical stimulation mapping (ESM) to remove the tumor while preserving essential functional areas. In our study, we used fUS imaging to record the brain activity during the surgery, while ESM served as a reference method. We demonstrated that fUS was able to map the brain activation in deep cortical regions as a response to a task-related stimulus, with a good spatial discrimation of neighbouring functional areas. fUS imaging has a great potential for intraoperative guidance of tumor resections by imaging stimulus-based activation in real-time, with a high sensitivity and spatial resolution. Intraoperative fUS imaging of “mouth-sensitive”-evoked brain activation in a human patient. The results show a good correlation between the cerebral blood flow (CBV) increase and the stimulus, as well as a good spatial localization of the activated area.